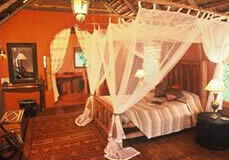 merges naturally into the indigenous milk wood and acacia forests and is flanked by 13 thatched chalets built on stilts. The Chalets have wooden floors, reed walls and thatched roofs. 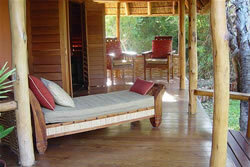 Each chalet consists of a double room, en-suite bathroom with a shower and a veranda / balcony. Six chalets contain double beds and the rest are twin bedded. Each chalet offers its own wonderful sea view and immediate access to the beach. Sunsets, peace and solitude are a reality at Benguerra allowing the visitor to choose what to do – or not to do. Guests can relax on unspoilt, uncrowded, pristine beaches or for more active moments there is excellent bird watching, superb diving and snorkelling as well as excellent fishing. Nor should one miss the dhow cruise to view the flamingos. Generator lighting AC 220 volts, solar power is used to heat water. Videos can be recharged AC 220 volts, 3 pin round plugs. Deep sea diving, snorkelling, game fishing, fly fishing, deep-sea fishing, dhow cruises, castaway picnics, beachcombing, bird watching, visits to freshwater lakes, mainland excursions to Vilanculos, wind surfing and volley ball. To encourage visitors to enjoy pristine reefs where no coral bleaching has taken place, we have a fully equippeddive school with Dive Master certified for PADI and NAUI. There are numerous reefs to explore with stunning arrays of coral, fish species, rays, turtles and, if lucky, dugongs. Two-Mile Reef is well known for superb opportunities to see many species of game and reef fish – and, of course, to view the magnificent untouched corals. All the equipment is available and is included in the cost of the dive. Diving courses may be completed at the Lodge and resort courses are offered. Fishing at the Lodge is excellent. Game fish such as king-, queen- and spanish mackerel, kawakawa, kingfish, queenfish and sailfish can be caught all year round. Marlin season is from November – March. The boats (Ace-cats), with experienced skipper and ghillie aboard are fully equipped with 20lb rods and reels for 4 anglers. Two special saltwater flyfishing boats with experienced guides are available. Numerous species can be caught on fly. The Lodge maintains four 22-foot Ace-cat boats ready to do battle with the monsters of the deep - such as Marlin and Sailfish. They are fully equipped with fighting chairs, outriggers, safety equipment, radios, and 20 lb fishing rods for four fishermen. Each boat is hosted by an experienced skipper and ghillie who know the waters intimately. King- queen- and spanish mackerel, kawakawa, kingfish, queenfish and sailfish can be caught. Marlin season is Nov - March. A policy of "Catch and Release" is encouraged and all boats have the necessary equipment on board for tagging. 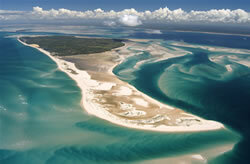 The waters around Benguerra boast some of the finest saltwater flyfishing on the continent. Fly fishers can pursue all the above game species, including the much sought-after bonefish, which are also caught deep fishing from time to time. Two specialist boats, “High Flyer” and “”Ahab”, with experienced guides are available, each able to accommodate 2 fly fishermen. Sail silently in a traditional Arab dhow along the coastline in search of the island’s flamingos or glide peacefully, late afternoon with sundowners, to witness one of Africa's marvels - the magnificent sunsets. Because of the diverse habitats – coastal dunes, open grasslands, freshwater lakes, savannah and acacia woodlands - over 125 species of birds, including all the sea birds visit Benguerra Island. See if you too can spy the elusive crab plover. To maintain the ecology and social integrity of the Bazaruto National Park, a long-term "Multiple Resource Use" project for the Archipelago is underway. Benguerra Lodge subscribes to the wise and sustainable use of the resources and contributes financially to the project. A donation of US$10 per person is requested for the multiple resource project. Payment for all reservations are due prior to arrival at the Lodge. 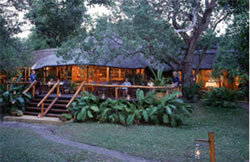 All extras incurred on the island are due in full on departure from the Lodge, in US Dollars or SA Rands. Visa, MasterCard, and American Express accepted, but not Diners Club.